ES Elastomeric Sealant is a Flexible Fire stop Protection for Fire Rated Joints. - Odourless can be painted over it. - Ready to use-no mixing. The Polyurethane Joint Sealant is idyllically utilized for filling the cracks and joints immaculately to provide optimum strength to the floor. This sealant range is processed by making use of optimum quality constituents including polyurethane in accurate ratio along with the employment of advanced methodologies. 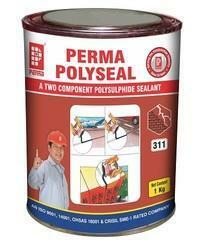 We offer silicon sealants, which are used in industries like construction, textile and automotive. These are also used in building applications, industrial sealing, bonding and insulating usage.Advantages : :: Solvent free and non-sag. Low shrinkage on curing and remains flexible at low and high temperatures. 100% expanded PTFE, it gives an excellent performance in sealing Fianges, Pipes, Cointainers, Hydraulic and Pneumatic Systems etc. Stag Jointing Paste Type B is a smooth consistency lead free jointing compound with a temperature resistance of over 650 degree C.
Seal Tuff Version - 2 for exposed as well as cover with any protective layer or tile or cover.